This workbook is intended to give students a thorough review of first grade math. It has both topical as well as mixed (spiral) review worksheets, and includes both topical tests and a comprehensive end-of-the-year test. The tests can also be used as review worksheets, instead of tests. You can use this workbook for various purposes: for summer math practice, to keep a child from forgetting math skills during other break times, to prepare students who are going into second grade, or to give first grade students extra practice during the school year. In addition to the topical reviews and tests, the workbook also contains some cumulative (spiral) review pages. 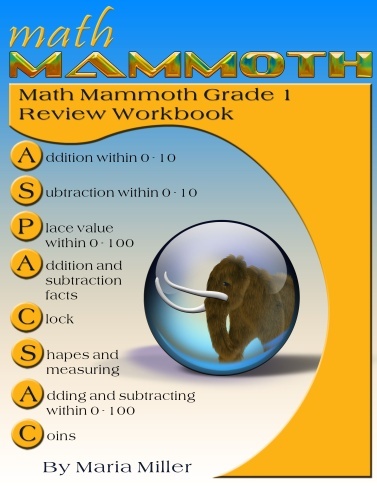 The content for these is taken from Math Mammoth Grade 1 Complete Curriculum, so it works especially well to prepare students for grade 2 in Math Mammoth. However, the content follows a typical study for grade 1, so this workbook can be used no matter which math curriculum you follow. Please note this book does not contain lessons or instruction for the topics. It is not intended for initial teaching. It also will not work if the student needs to completely re-study these topics (the student has not learned the topics at all). For that purpose, please consider Math Mammoth Grade 1 Complete Curriculum, which has all the necessary instruction and lessons. At HomeschoolMath.net, you can generate additional, free 1st grade math worksheets to supplement this book.